we will check your mobile number. You will then be given a slip of paper which clarifies when you will be contacted and what you should do. If you do not want to receive a text message or are unable to please discuss this with the member of staff taking or ordering your test. Most blood results to take 1-5 working days to return but some particular tests take longer (those for wheat sensitivity/celiac and special blood clotting tests - you should be advised if this delay is anticipated). 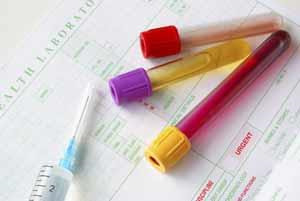 Urine samples take up to one week and swabs 1-3 weeks dependant on the test requested. You will receive a text message when they have been received and been reviewed by a doctor. You will receive a text saying no further action is required or that you should see a doctor. If you are advised that further action is required everything may have been normal or been treated by care already received and you do not need to return to the doctor unless follow-up has already been agreed or you feel that symptoms persist and require further review. If you receive instruction to review with a doctor please phone the appointment line (or use the internet if registered) on 0115 846 8888. If you are due to see your doctor as part of a planned follow-up, you will still receive a text. If its says abnormal see the doctor please ensure you keep your agreed appointment. You do not need to see the doctor earlier! If the test showed something important the doctor will contact you directly to bring forward your follow-up. Do not ring to ask about your results, the telephone staff are not trained to give results information. When you do ring for an appointment as instructed by a text please make a routine appointment with the Doctor ordering the test. If the doctor feels you need to be seen sooner/urgently they will contact you directly rather than the standard text. Occasionally results may arrive at different times. This can lead to receiving more than one text. lf you receive any text saying see the doctor then please arrange an appointment. If you have problems with this system or have any comments about it do not hesitate to contact us. If you have not received a text in the time expected then contact the practice.